A second-grade student reportedly attending elementary school in California does not appear to be a fan of the Common Core math curriculum. See his hilarious response to a math question HERE. New video, posted online late Sunday, appears to show a police officer blindside a woman as students became unruly following the University of Arizona basketball team's overtime loss in the NCAA tournament. See the clip that is quickly going viral HERE. On Friday, ESPN commentator Stephen A. Smith defended Kobe Bryant's recent remarks on the Trayvon Martin case — and openly admitted his stance would "upset" a lot of black people. Watch the segment from The Arsenio Hall Show HERE. U.S. stocks are on the verge of a fast-moving, historic collapse. This urgent report explains what will happen next AND reveals the simple step you must take NOW in order to protect your wealth. Click here to view this free report now. Author Michael Lewis is out with a jarring claim: the stock market is "rigged." The man behind the new book "Flash Boys" appeared on "60 Minutes" Sunday to explain why, and it has a lot of people talking Monday morning. Follow Lewis' thinking HERE. In a Moscow Times interview, action movie star Steven Seagal stated that he's on board with Russia's military action in Crimea. He's pals with Vladimir Putin and may even move to the former Soviet Union someday. Get the entire story HERE. A White House reporter who got an unprecedented look inside Saudi Arabia during President Barack Obama's visit and tweeted some of what she saw launched herself into a social media explosion. See the images HERE. An Israeli Air Force (IAF) fighter pilot captured a photo of himself while flying upside down over Tel Aviv, a breathtaking selfie that's now going viral in Israel and beyond. See the now-viral image HERE. Wolverine … on Broadway? During an interview with BBC Radio, Hugh Jackman delivered an impressive mash-up performance of his "Les Miserables" signature song with lyrics about his massively successful "X-Men" character. Watch the Oscar-nominated actor in action HERE. The Glenn Beck Program -- Can Rand Paul (or any Libertarian candidate) win in 2016? Glenn welcomes Kevin Williamson to discuss the chances that a Libertarian could win the next Presidential election. -- 5pm ET or on-demand on TheBlaze TV. Real News from TheBlaze -- Tonight's hot topics for the panel: Political Scapegoating 101, God & Hollywood and Obamacare Enrollment Ends (Kinda) -- 6pm ET or on-demand on TheBlaze TV. Wilkow! -- Andrew looks at the Department of Homeland Security's "catch and release" program that put almost 70,000 illegal immigrants with criminal convictions back on the street in 2013 alone. -- 7pm ET -- only on TheBlaze TV. FOR THE RECORD & REAL NEWS INVESTIGATES -- Wednesday night, beginning at 8PM ET, FOR THE RECORD returns with an in-depth look at the vulnerability of the US power grid. Immediately following at 8:30, REAL NEWS INVESTIGATES looks into the mysterious circumstances behind the attacks on the power plant in San Jose, California. -- Wednesday, starting at 8pm ET -- only on TheBlaze TV. Why not kick off your week with a freaky and hilarious cat video? 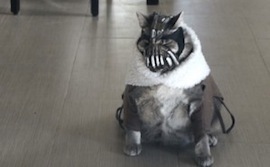 Say hello to 'Bane Cat' HERE. Glenn Beck's father passed away over the weekend at the age of 86. Monday, on his radio program, Beck said that something remarkable happened just before he died. Watch him explain what he witnessed HERE.